This is a guest post from Vicky Vella, EM Associate Specialist in the UK. Vicky got in touch after this tweet came onto our timelines recently. I had to admit that I was also unaware of these important guidelines. I think we all need to read them, as you’ll read at the end of this post, they really do matter and they will change your practice. A few weeks ago I did a straw poll of EM doctors – I asked, ‘If I said MARSIPAN Guidelines to you would you know what I was talking about? There were several answers about Christmas cakes, but otherwise the answer was ‘No’. It didn’t surprise me that much, I probably wouldn’t have known myself a couple of years ago, but as they relate to the psychiatric illness with the highest mortality of all. Stop for a moment and think waht that diagnosis could be? Hold that thought and then just agree with me that if we have a disease with a really high mortality that can present to the ED then it’s our business to know how to recognise it and what to do about. The disease is Anorexia Nervosa. Well done if you know this already, but don’t be ashamed if you did not get it right. Many people don’t know about the effects of AN in our society and even in the clinical professions we may not be aware of how to assess and treat this vulbnerable group of patients. Fortunately there is guidance out there. 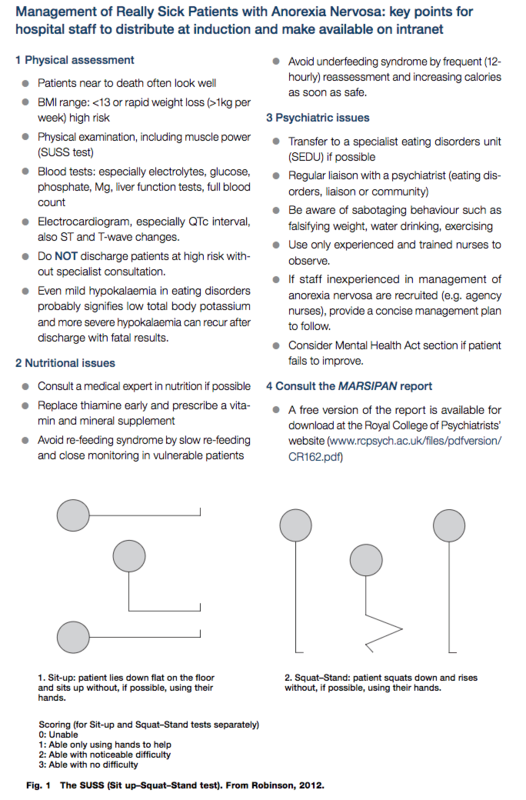 The MARSIPAN (Management of the Really Sick Patient with Anorexia Nervosa) guidelines help us to risk stratify those who present to the ED with AN, to decide which of these patients are at high risk of death from the physical effects of the illness, and therefore who needs to be admitted for re-feeding. Anorexia Nervosa, as mentioned earlier, has the highest mortality rate of any psychiatric illness at 20%. Let that sink in. One in five AN patients will die as a result of physical complications or suicide. They may present to the ED for two reasons, firstly because they are not eating/drinking enough, in which case they are usually brought by a desperate family member, or secondly as a result of an overdose or self-harm. Stop and think about the last patient you saw with AN. Is it possible that you may have missed a case? It is possible, probable even that we are missing cases in the ED. For example we know that we see many patients who have taken an overdose or self-harmed in the ED. Some data suggests that over 50% of those who self-harm report a co-morbid eating pathology, but do we routinely enquire about this when assessing our patients? It’s clearly worth asking the question when we see these patients in the ED although it can be difficult. Patients tend to be very secretive about their illness and so are unlikely to offer the information unless they are specifically asked. This is something we should do as if you don’t look for it you won’t find it. Another group of patients who may hide their AN are those with Type 1 Diabetes. It is reported that over 60% of those with Type 1 Diabetes between the ages of 16-25 years intentionally miss out doses of insulin in order to lose weight1, a condition sometimes referred to as ‘Diabulimia’ .That number is staggering, and this is potentially a deadly combination, so again, it’s worth asking the question to those presenting with DKA. You may be reading this and thinking that it’s perhaps not relevant to your practice as you don’t see many young girls in your department, maybe you are an adult only ED. Although the peak age of onset for AN is during the adolescent years, those young people grow into adults whilst they still have the illness – for many their illness lasts a lifetime. There are a growing number of adults in their middle age developing the illness too. It is also more common in males2 than you might think, 11% of those with AN are male. Around 1 in 250 women and 1 in 2000 men will experience AN at some point – so not that rare. So back to MARSIPAN. The Junior MARSIPAN Guidelines were published by RCPsych in 2012, and the Adult Guidelines in 2014. Both the Junior and Adult guidelines give us guidance on how to risk assess these patients using physical assessment and some psychiatric assessment, therefore helping us to decide who might require admission to medicine or paediatrics for urgent refeeding. It is also worth noting that the guidelines also give advice about compulsory detention for treatment of AN. Refeeding is accepted as a treatment for anorexia nervosa and therefore patients can be sectioned under the Mental Health Act for refeeding. Patients with AN are expert negotiators, and will use all of their skills to talk us out of admitting them to hospital, to avoid having to have food or water. They will also use these skills to get their parents or carers on their side, which can also lead to safeguarding issues. If the patient is at high physical risk and refuses admission then a compulsory admission should be considered and discussed with the mental health team. As ED doctors we are often faced with junior specialty doctors not wishing to accept a referral from us, and as there is so little teaching on AN for medical students and junior doctors, they also may not be aware of how potentially serious this condition may be. It is therefore up to us in the ED, as we so often do, to lead from the front and make the admitting team aware of the guidelines and the risks to our patients. So how do we assess in the ED? The MARSIPAN guidelines have an excellent one page summary of how to assess patients in acute care settings. They have asked for this to be distributed widely to clinicians at induction. This divides the assessment up into physical, nutritional and psychiatric issues. These are from the adult guidelines as there is no equivalent assessment for in the junior guidelines although there are clear similarities between the two guidelines. You can download a CHECKLIST FOR MARSIPAN here. The RCPsych say they want to have it widely distrubuted, but it’s not creative commons and we would need to apply for permissions so we can’t reproduce here (sadly). The link is good though so please have a look. Key issues in the ED are in the identification of electrocardiographic, electrolyte imbalance and in ensuring that we get an accurate weight, height and BMI calculation. The SUSS test is a rapid clinical assessment that requires no additional equipment but which can provide a useful value to facilitate referral. Anorexia Nervosa is probably more common than we think, it’s a high risk illness and one that can be devastating for patients and their families. This Christmas spare a thought for this vulnerable group of patients and make sure that you’re department is able to identify and help these patients and their families. By Simon: Since helping prepare this blog I’ve learned a lot. We have had several patients in whom we’ve had a conversation about eating disorders, which I would not have had without learning about Marsipan from Vicky. For example patients with multiple DKAs in recent months turned out to be omitting insulin to lose weight. This blog has changed my practice and I think it should change yours. Thanks for a really interesting and useful reminder. I am one of the EM docs who had heard of and actually used this. Albeit in the context of my PEM rotation in Gen Paeds. At the time I was struck with the “how many high risk kids (patients) have I missed?” question. Focusing simply on electrolyte abnormalities and ECG changes. Well there is a lot more to it isn’t there? But also as patients who are often challenging in the consultation, have I backed away from assessing in as much detail as I could? 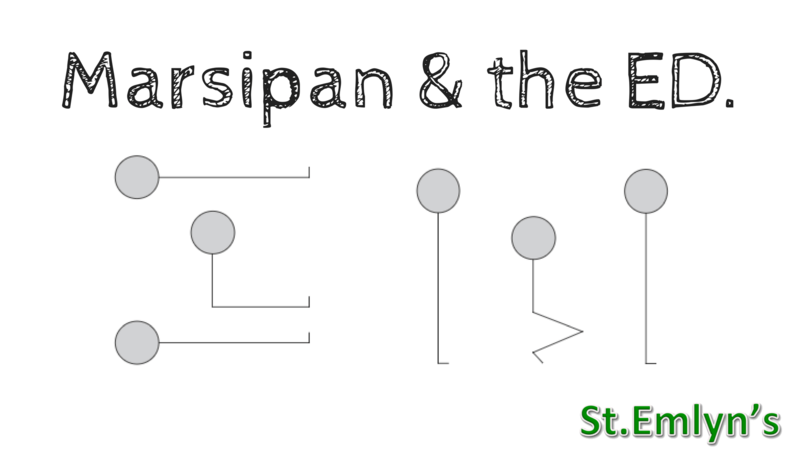 MARSIPAN provides a structured framework with really clear questions to be asked, focusing the interaction. As an aside re patients at risk for eating disorders… I wonder how many of our complex gastro patients for example those with cyclical vomiting, gastroparesis, SOD… have developed/are developing an eating disorder? Some of the behavioural patterns that we see seem to overlap and you can imagine why aversion may have developed. Should we be considering assessment in some of these patients? Thanks Nicola. I think we are more attuned to this in PED generally and agree that the structure in the guidelines is really helpful. As for other patients with gastro disorders then yes I think we should.